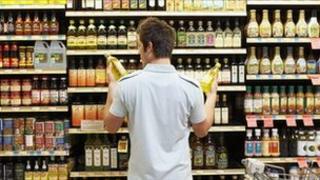 A new consistent system of front-of-pack food labelling is to be introduced in the UK, the government says. A combination of colour coding and nutritional information will be used to show how much fat, salt and sugar and how many calories are in each product. But as yet only just over 60% of foods will be covered by the system because it will remain voluntary. The announcement comes after a decade of debate about the issue and has been welcomed by consumer groups. The introduction of a consistent system has proved problematic partly because of the difficulty of getting industry leaders to agree on the labels and because mandatory regulations require agreement on a European level. The problems have resulted in a variety of different systems being introduced. The unveiling of new labels comes after a public consultation last year and months of talks with the food industry. The deal has been welcomed by campaigners, who have argued a clear and consistent system of food labelling would help combat obesity. One of the key steps has been the inclusion of colour coding. Research by the Food Standards Agency has shown that consumers prefer traffic light labelling because it offers key information "at a glance". Over the next 18 months the new labels will be rolled out across many of the major food groups. They include retailers such as Tesco, Sainsbury's, Asda, Morrisons, the Co-operative and Waitrose, which will display the labels on their own brand foods, as well as manufacturers Mars, Nestle, PepsiCo and Premier Foods. Public health minister Anna Soubry said: "By having all the major retailers and manufacturers signed up to the consistent label, we will all be able to see at a glance what is in our food - this is why I want to see more manufacturers signing up and using the label." Richard Lloyd, of consumer group Which?, said it was a "big step forward". Charlie Powell, director of the Children's Food Campaign, also said the move was pleasing. But he added: "There are now no excuses - all food companies should follow suit and the government should name and shame any which drag their feet." He also urged ministers to do more to protect children from junk food marketing. Among the major names not to have signed up are Coca-Cola and Cadbury - both of which released statements saying they felt the use of guideline daily amounts was a better system. Andrew Opie of the British Retail Consortium, said of the new labels: "This is great news for consumers. "A consistent scheme across all the major supermarkets means wherever we shop we will see the same front-of-pack labelling. "That will help improve understanding of the label and make healthier choices easier."